Studio DIY came up with this genius no sew, no fuss idea for a pregnant Halloween costume, and the bump gets to be the avocado seed! All you need is a green and a brown t-shirt for this pregannt avacado costume! This is actually more than a couple costume, it’s a family costume! 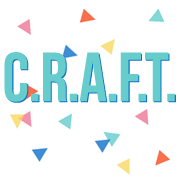 Jamie from C.R.A.F.T. is 19 weeks pregnant and that’s why she included the little squirrel in her happy tree. Bob Ross is really easy to make, all of the clothes came from the closet and she made him a pallet out of cardboard and bought the brown afro. The happy little tree started as an XL men’s t-shirt and the squirrel is made of felt! The fall leaf garland got chopped into 5 strips and made into a headpiece, bracelets, and shoulder pieces. See lots more pictures and the full Bob Ross, happy tree, and squirrel DIY costumes at C.R.A.F.T. Jodi and Meaningful Mama is a costume genius! (You can see her sweet Candy Land family costumes here.) Here’s what Jodi said, “I was really pregnant when I came up with this idea. I was really hoping I would make it to Halloween just so I could wear the costume! I made the bowling pin out of felt. I cut out the shape of the pin, sewed on the red stripes and sewed the two pieces together and cut out holes for my belly and face. I used wire hangers taken apart to make the structure stand tall.” Oh and of course she added 3 little felt dots to her bowling ball belly! And Jodi’s husband just found his shirt at Goodwill! Easy peasy and super cute! It’s International Astronomy Day! And this costume is out of this world, ha! I couldn’t decide if this should be a couple costume or group, since it is technically for 3 people! Modern Kiddo holds a Halloween costume parade each year and this handmade pregnant Halloween costume was one of many really awesome costumes in the parade. You could use fabric glue to attach a felt sun to your belly. Pain Styrofoam balls to represent the planets and attach to your arms. Galileo just needs a black robe (a black graduation gown would be perfect) and a telescope! Did you dress up for Halloween when you were pregnant?